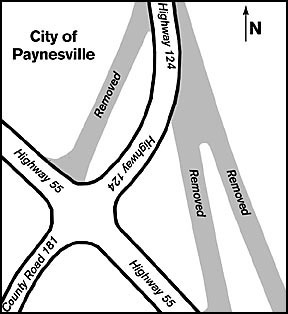 Drivers in Paynesville can expect detours when Highway 124 (Lake Avenue) is reconstructed this spring and summer. The project, originally scheduled for last summer but delayed until 2003, has now been bid, with the bids coming in lower than the engineers' estimates, according to the Stearns County Highway Department. The Paynesville City Council and the Stearns County Board of Commissioners still need to formally accept the bids. The item is on the city council's agenda for tonight and should be on the county board's agenda for next Tuesday. The project includes rebuilding the road and reconfiguring the south intersection with Highway 55, eliminating the ramps and making the intersection more perpendicular. Stearns County has received bids for the rebuilding of Highway 124 (Lake Avenue) in Paynesville. The project was scheduled for last summer but was delayed. Now work could start as soon as road restrictions are lifted this spring, probably late April or early May. The road, which is being turned back from the state to the county, will be renamed CSAH 66. Meanwhile, the city of Paynesville will be redoing city utilities (sewer and water lines) and working on the storm sewer, including constructing a stormwater retention pond to the east of Lake Avenue. Work should start as soon as the spring road restrictions are lifted, according to the highway department. That depends on the spring, but usually happens between mid-April and early-May. When work on the project starts, traffic will be detoured. Traffic thru town will be detoured using Highways 23 and 55, bringing traffic all the way to the intersection of 23 and 55 on the west end of town. Residents along Lake Avenue will always have access to their house, according to the highway department. The city extended South Street last summer in part to provide residents on the east side of Lake Avenue with another route to their houses. Access from Highway 124 to Co. Rd. 34, though, will also be affected by the project. The alternate route for these residents east of town will be to take 283rd Avenue to Highway 55 and then into town. The project should take 55 working days, or until August, to complete. The county now usually puts down only one layer of pavement the first year, then allows the road to settle through a freeze cycle before adding the final layer of pavement the next spring. For Lake Avenue, the final layer would done in spring 2004. The state has turned Highway 124 over to the county. Once the project is done, the road will be renamed CSAH 66, though by city street designations it will still be called Lake Avenue. The low bidder for the project was Kuechle Underground of Kimball in the amount of $988,285, according to the highway department.